Room with 2 single beds or 1 double bed, 2 bed-side tables, separate business area, desk, armchair, chair, 2 wardrobes, sofa, coffee table, trousers-press, luggage-stand, mirror and a coat rack. Room with one double bed or twin beds on the 1-4th floors. This 4-star hotel is situated near Petrovsky Park in Moscow,at a 5-minutes walk from Dinamo Metro Station. The Aerostar Hotel offers air-conditioned rooms and free usage of gym and sauna.On-site parking is free at the Aerostar Hotel Moscow. 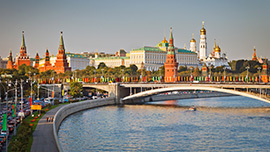 It is just 10 minutes by underground train from Moscow city centre and the Kremlin. Prices are based on breakfast included. Lunch and dinner are served at extra charges. Located in one of the Moscow’s major highway, Leningradskiy Prospect. The Kremlin, Red Square, Lenin Mausoleum, Ice Palace Megasport, Central Moscow Hippodrome, Moscow Zoo, Moscow Hermitage Garden, Yeliseyevsky Shop, Bolshoi Theatre. 30 minutes distance from Sheremetyevo International Airport. Brasseri Erte: buffet-style breakfast and business lunch. Peterhof (17:00-23:00): Dining restaurant/Russian cuisine.